Parents like to dress their children up all year long, but during the festive season, a fun outfit is even more important than the rest of the year. Especially for you as a photographer, festive clothing can be another way to bring creativity to your work. 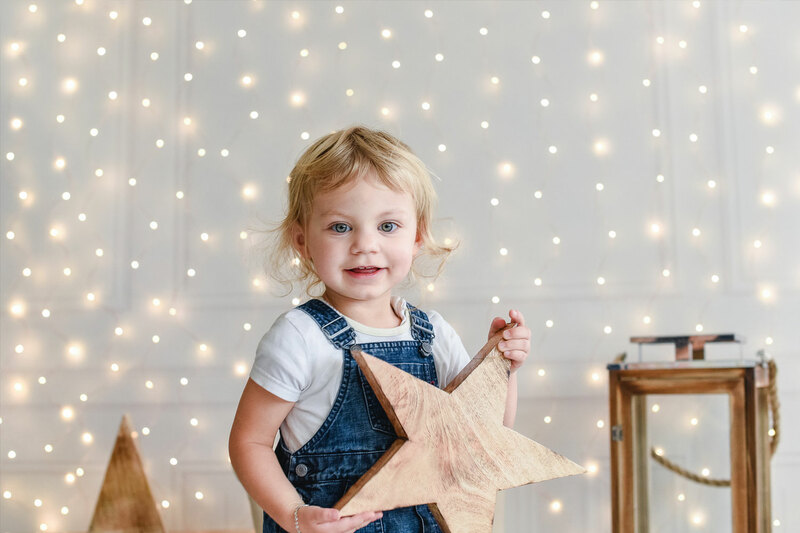 In this blog, we will advise you on the best outfits for children (and their parents) to wear for a Holiday themed photoshoot. 1. Use the classic Christmas colors: green, red and white. We don’t want you to match the Christmas tree, but these colors are often popular when it comes to Christmas decoration. They also suit clothing really well. Make sure to pick dark and warm colors of green and red. We don’t want the kids looking like the Grinch. Other classical color-combinations for Christmas are bright white with pale pink, beige, gold, silver, or blue. In this case, if you use spruces in the background as well, they should not be bright green, but better white or silver color. It is easy to overdo a Christmas outfit. A lot of glitter here, some more accessories there, but especially for photoshoots, try to dress your child as simply as possible. We don’t want to see what the child is dressed like, but rather want to see what the child looks like. Same goes for colors like silver and gold. They are perfect for the holiday season, but try to use them subtly instead of transforming your child into a massive golden cupcake. As the winter season is often seen as a depressing, dark and cold period of the year, use a lot of light and the color of our favourite winter element: white snow. White makes the picture look positive and energetic. When the child is wearing white, it also gives them an angelic appearance. Try to put accents of other colors in the outfit though, otherwise your child might end up looking more like a snowman instead of an angel. Make sure your fantastic festive shots do your business justice with this guide on how to make the most of holiday sales. Many of us celebrate a big part of Christmas in our pyjamas, so why not wear them to the photoshoot? This might seem odd, but there are a lot of festive matching pyjamas that will give your pictures a warm and natural appearance. The children might even feel more comfortable in pyjamas then smarter festive outfits, which can help them pose more naturally in front of the camera. To keep away from fashion trends that embarrass your kids later when looking back at the pictures, try to dress them up in timeless or vintage outfits. This way, you’re already making the scenery traditional and adding an element of formality. Another pro: grandparents love to see their little ones dressed up the way they used to look themselves. An alternative setting for Christmas photos is to take them outside. Pull on your nice jackets, hats and gloves and smile away. If you have a white Christmas, you’re in luck! Start a snowball fight or make snow angels. The kids will have a lot of fun, providing natural and aesthetically pleasing pictures. For adults, it is a childish tradition to wear ugly sweaters for Christmas, but which child doesn’t look good in a comfy sweater? Of course, scratching the ugly from the sweater is something you’ll have to do – and maybe also try to convince the child that the Frozen sweater might not be the best option for a photoshoot. Sweaters in general however will add a natural, cozy atmosphere to the pictures.